Sunday Supper is partnering up with a new sponsor this week and I’m so happy to be a part of it. The Beef Checkoff is joining us around the Dinner table! Let’s give them a warm welcome by talking about “Beef…. it’s what’s for dinner.” I think of my husband when cooking beef for my family. He once told me that he never liked beef while growing up. It was only as an adult that he realized it wasn’t that he didn’t like beef it was because his Mom always over cooked it. Now that I cook for my own family I’ve realized the way you cook beef does matter in the taste. I’ve cooked a lot of different kinds of cuts, but I still have a few I need to try out. I was lucky enough to attend the Food and Wine Conference a few weeks ago and one of the demonstrations was done by Beef Checkoff. It was so great to learn different ways to cut Beef. The employee talked about buying a large piece of Beef and how to really maximize the cut. She then proceeded to cut them into small filets, strips for stir fry’s and even kabobs! If you want to save money this is the way to go. Cut, package, label and freeze! Since becoming a parent and really caring about the choice of foods I give my family I’ve come to appreciate all types of beef. Filet is by far one of my favorite cuts. I don’t prefer fatty cuts of beef like my husband does. The fattier the better as far as he’s concerned. I’ve yet to make him a Prime Rib. Believe it or not I’m a big fan of slowly roasting beef. Whether it be in the oven or in the crock pot. Nothing beats a good pot roast on a cold winter night. However during the summer months steak tips are a favorite in our home. I absolutely love making my own marinade and letting them sit for 24 hours taking in all of the flavors. Sometimes I even buy Sirloin strips from the local meat market and cut them into tips, it’s cheaper and I buy them plain on purpose to make a new marinade. 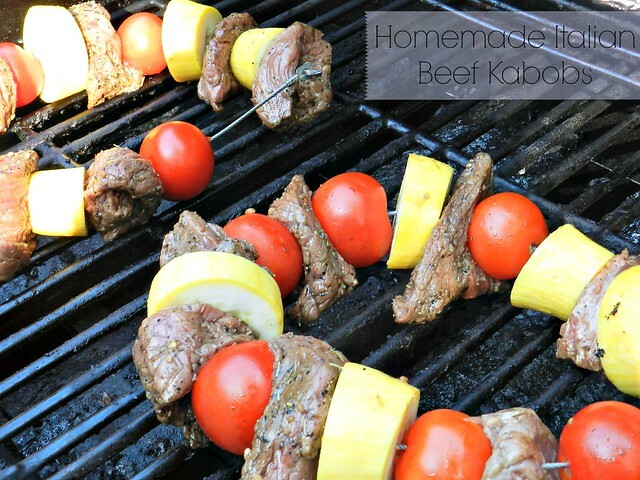 I decided to make Kabobs for this event and this is one you HAVE to try. It’s so good and has the perfect amount of herbs and spice. So break out your favorite skewers and let’s get our Beef on! Combine the vinegar, Worcestershire sauce, seasonings, garlic, lemon juice, and oil in a small bowl and whisk together to combine. Pour the marinade into a zip lock bag. Cut the tips into large chunks and place inside the bag. Remove the air and make sure you coat all of the tips. Place in the refrigerator and marinate for at least two hours (I always do mine for 12-24 hours and I flip the bag when it’s at the half way point. Break out the grill, heat to a medium heat. Cut the summer squash into large chunks, I like the larger chunks so they cook evenly with the beef instead of being done before the beef is. Skew the beef alternating with squash and tomatoes. This made 4 large skewers for us. I also used a different kind of skewer this time, I’ve never seen ones like this but since I got it as gift at the Food and Wine Conference I figured I’d give them a try! We loved them! I didn’t notice until after that I could have skewered them first and then placed the whole skew into the bag marinating the vegetables as well. I am going to try that next time because it was a messy job threading them and why not let those veggies get some flavor too! Grill for approximately 10 minutes, flip and grill for another 5-8 minutes. Let the skewers sit for 5 minutes before serving. We all know Beef needs to sit for an approximate time before eating right??? It makes all the difference! Now let’s see what everyone else brought to the dinner table this week! So much beef where do we start?? 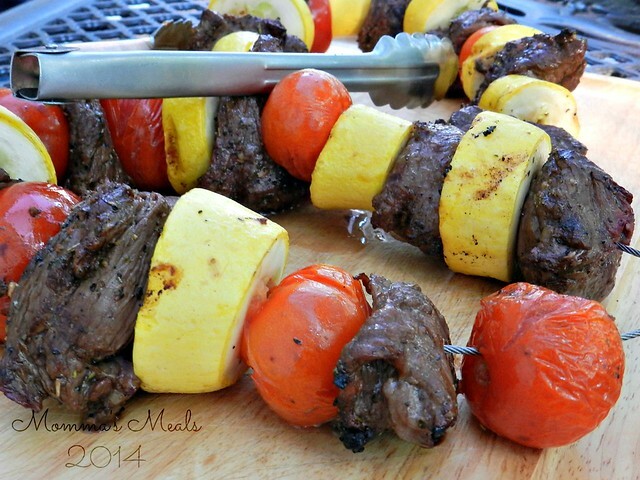 Your beef kabobs look mighty delish! I love the Italian flavorings! Yum! Great recipe and I can’t wait to try it with those skewers from the conference too. Drooling for your kabobs, I love those skewers they hold so too! These kabobs just scream “healthy” to me. I love that you used squash in them. Now I know what is the first thing I will do with those skewers! Your kabobs look picture-perfect! This is such a fun recipe and I am looking forward to trying it! These look so delicious and juicy. This would be great for company! I love combining Worcestershire and balsamic in beef marinades! I still have to use to skewers. They look so cool! These sounds absolutely delicious, Tammi. I love all the beef, lean or fatty (but I really do love the fatty bits!). I never make steak tips at home since they are best grilled but they are so good and your kabobs look fantastic! Don’t you just LOVE those skewers? I’ve only used them once, but I dig them. Because even when I soak wooden skewers in water for like, a full day beforehand, they still burn. 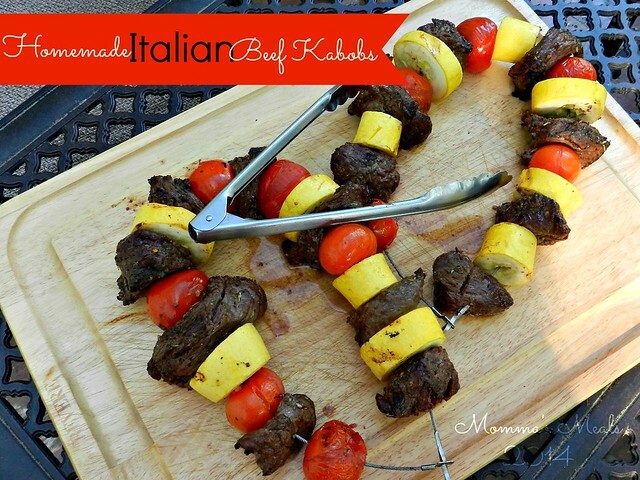 Great looking kabobs, Tammi! I love those skewers, and those kabobs YUM!! Beautiful Kabobs! It’s great to have so many educational components from blogging and support from the different groups – how lucky to have had that class from Beef Checkoff. Thanks Christy! I was very lucky to have had that class!